Earlier this year, Not The Barnet Times revealed that in 2008/09, Cllr Brian Coleman was paid almost £103,000 in allowances for his roles on Barnet Council, the Greater London Authority (GLA) and the London Fire & Emergency Planning Authority (LFEPA). Now for most people, £103,000 a year would be quite sufficient. But not for our Brian. The Local Government Chronicle reports that Mr Coleman has just been appointed chairman of the Local Government Association Fire Service Management Committee, Fire Services Forum, and National Joint Council for Local Authority Fire and Rescue Services. For his role as chairman of the Fire Service Management Committee, he will receive an allowance of £10,266. As chairman of the National Joint Council for Local Authority Fire & Rescue Services, he will receive £5,130. All in all, Brian Coleman - who earlier this year raised infant burial charges by 6.25% - has filled his trough with another £15,396 of our money. And this is before you add in the cost of all his taxis and free dinners. These new allowances are paid by the Local Government Association (LGA), which is a quango funded by local authorities. Barnet’s current subscription is £103,732 - nice to see that nearly 15% of our annual sub is finding its way back to such a deserving cause. For those interested in the archaic concept of democratic accountability, you may be wondering when Mr Coleman was elected to these new roles. Well, of course, he wasn’t elected. He was appointed by fellow Tory, Cllr David Shakespeare, leader of the LGA Conservative Group. It is somewhat ironic that in the same week as Coleman trousered these new allowances, David Cameron announced that a Conservative Government would cut Ministers’ pay. Further proof of how detached from Conservative thinking Coleman and his fellow Tory troughers on Barnet Council have become. 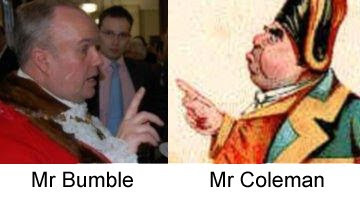 Thanks to Mr Toad for his Bumble / Mayor picture. It’s Not The Barnet Times Wot Done It!